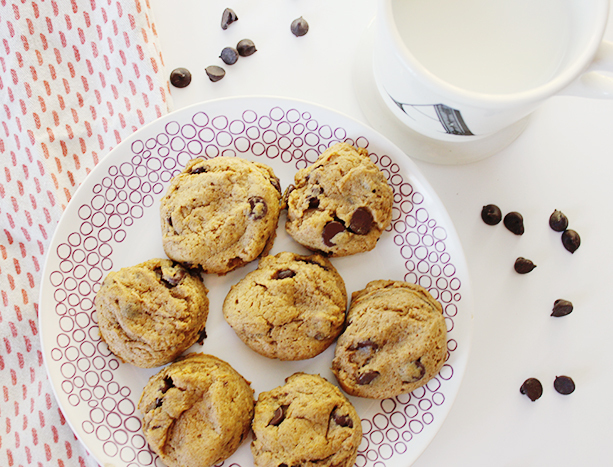 These pumpkin chocolate chip cookies are one of my new favorite things about fall. And I have a lot of fall favorites. How to Get Away With Murder the second season, evening walks, sweaters, picking out the kid's Halloween costumes ...just to name a few. I've always been a fan of pumpkin chocolate chip cookies, but these won me over because of the texture. They're a lot less cake-y and a lot more cookie-y. They are still incredibly soft, so no worries there. We made these yesterday and they're already gone. You better believe I'll be making them again tomorrow. Take the dough out of the refrigerator. Preheat oven to 350°F (177°C). Line two large baking sheets with parchment paper or silicone baking mats. Roll the dough into balls, about 1.5 Tablespoons of dough each. Slightly flatten the dough balls because the cookies will only slightly spread in the oven. Bake the cookies for 8-10 minutes. The cookies will look very soft and under-baked. Keeping them in the oven for longer may dry them out. Remove from the oven and press a few more chocolate chips onto the tops, if desired. If you find that your cookies didn't spread much at all, flatten them out when you take them out of the oven. Make ahead tip: Roll the chilled dough into balls and freeze in a large ziplock bag for up to 2 months. Bake at 350°F (177°C) for an extra minute or two. Do not thaw. Baked cookies may also be frozen up to 2 months. Thaw overnight in the refrigerator before serving. Use 1 and 1/2 teaspoons of pumpkin pie spice instead of nutmeg, cloves, and allspice, if desired. Don't leave out the cinnamon. I like to add a lot of spices to increase the cookies' spice/pumpkin flavor. Go by your spice preference. Oh my these sounds yummy. Perfect recipe for the fall, and just when I am going to pick my pumpkins.